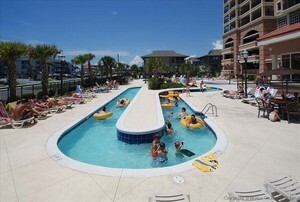 Tilghman Beach & Golf Resort is a stylish and luxurious high rise property in the Cherry Grove section of North Myrtle Beach. Located directly across the street from the beach, this property has all the bells and whistles that it's oceanfront competition does - magnificent outdoor pool, lazy river, indoor pool, kiddie pool, hot tub, and even a poolside grill. Being on the second row, many condos at Tilghman get to enjoy two different views - on the back side, the golf course, and on the front side, the ocean. There's also an outdoor play area for children, as well as a fitness center. Tilghman is very popular amongst vacationers, golfers and investors alike - stop by the Condo-World Sales office today or call to learn more about this beautiful yet affordable second row property!